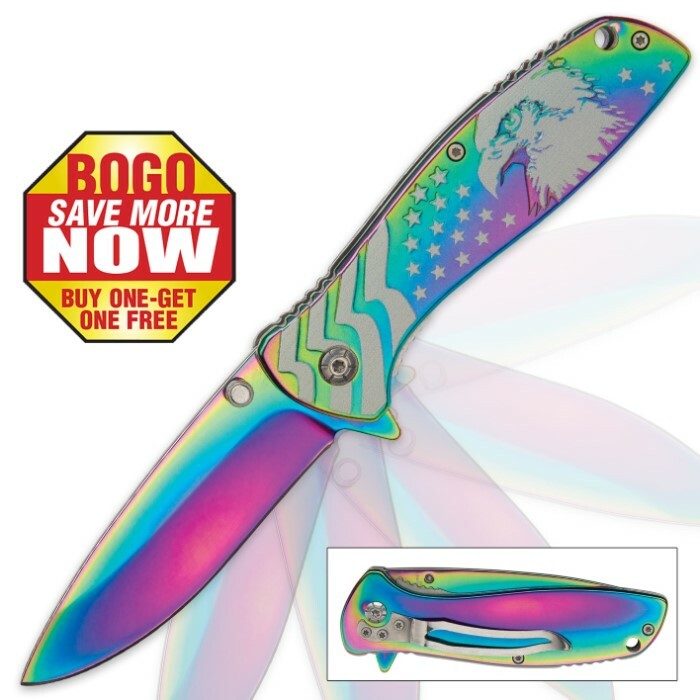 American Eagle / Stars and Stripes Assisted Opening Pocket Knife - Iridescent Rainbow Finish - BOGO | BUDK.com - Knives & Swords At The Lowest Prices! Don't miss out on this incredible pocket knife BOGO deal! Proudly show your patriotism every time you tackle day-to-day cutting tasks with this distinctive USA-themed assisted opening pocket knife. Blanketed in a striking iridescent rainbow finish, every color of the visible spectrum is on display, from the tip of the drop point blade to the back end of the elegant stainless steel handle. The unique folder's centerpiece, however, is a beautifully detailed bust of a stately American bald eagle, flanked by the graceful stars and stripes of "Old Glory." These stunning images are delicately etched onto the durable stainless steel handle - a vivid reminder of your pride in being an American citizen. But this tough folder is more than just a pretty face, boasting a razor sharp 3 5/16" stainless steel blade and rock solid construction. Thanks to the velvety smooth assisted opening mechanism, the carefully honed blade opens with impressive speed. Just nudge the handy flipper or thumb stud, and watch as it deploys in a flash of vibrant color! Once open, a sturdy liner lock keeps the blade fixed firmly in position for added safety and stability - especially important while performing vigorous cutting tasks. An integrated pocket clip and convenient lanyard hole make this 4 7/16" (closed) folder easy to carry every day, while its breathtaking beauty and charming allure make it equally well suited to display - on its own or in a fine knife collection. You're getting two for the price of one so make sure you gift one to a proud fellow American! This knife looks good and is priced right. What else do you want for about five bucks?